NORTH ROBINSON — The 2017-2018 edition of the storied Colonel Crawford swim teams will consist of a lot of familiar names. Head coach Mike Holtzapfel is entering his 18th season as the leader of the high school swim team and brings 29 years as the summer team head coach. He has more than 30 years of coaching swimming under his belt and will be joined by assistant coach Mary Lyons. Other familiar faces that will be hitting the water for Crawford in 2017-‘18 are seniors Chloe Carman, Pierce Krassow, Karlie Kurtzman, Nic Motter and Ken Fernandez. Those five seniors were all district qualifiers for the Eagles a season ago. Joining them will be fellow district qualifiers and juniors Jillianne Gregg, Hailey Ratliff, Kennedy Speck and Keton Pfeifer and sophomore Drew Krassow. 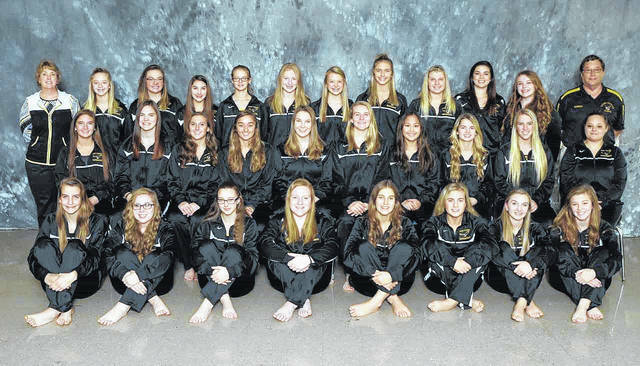 In 2016-2017, the Colonel Crawford Lady Eagles won the North Central Ohio Swim League and finished with a 5-1 dual-meet record. The boys team finished as the NCOSL runner-up and swam to a 4-2 dual-meet record. Last season was the first year in existence for the NCOSL. Although the Lady Eagles had no seniors lost to graduation in 2017, the boys squad will have to replace Alex Hershey and Jake Johnson, both of whom also qualified for districts last winter. Hoping to make an impact for the boys squad are a pair of freshmen in the likes of Kyle Taylor and Jacob Barnes. Over on the girls side, numbers and depth do not appear to be an issue. Holtzapfel says in his preview email, “rookie swimmers have experience and should contribute this season. Top prospects are (junior) Bailey Dixon, who is returning to swimming after taking the last couple of season off and the freshmen group of Alison Manko, Kaisey Speck, Emma Swisher, Cassidy Vogt and Jayden Ward that all bring ots of experience to the team.” “The main concern on the girls team is to continue to work hard at practice. The team has 13 new girls with various swimming backgrounds that are looking to contest for varsity spots,” concludes the head coach. The season is set to begin for the Colonel Crawford swimmers on Monday, November 27 when they host NCOSL rival, the Upper Sandusky Rams.